Good morning, East Tennessee! We are tracking a threat of severe weather today. Strong to severe thunderstorms may impact the region this afternoon and evening. The main threats include damaging winds and large hail. The tornado threat is low, but an isolated tornado or two cannot be ruled out. NAM model showing an approaching squall line this evening, with scattered strong to severe t-storm preceding the squall line. This afternoon, scattered thunderstorms will develop across the region. While these storms may be strong to severe, the main threat will come from a squall line that will progress into the region from Kentucky and Middle Tennessee. This line is expected to impact East Tennessee between 8 pm and 2 am. As of this morning, the Storm Prediction Center has shifted the “Slight Risk” area slightly to the west. 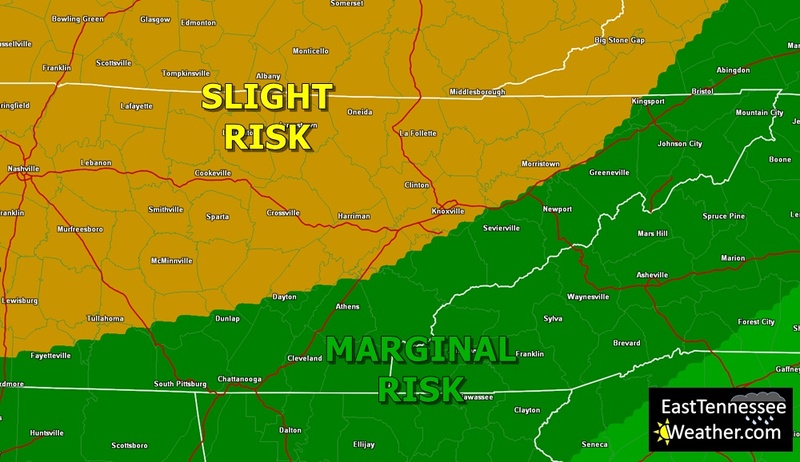 While a large part of the regions remains under the risk area, the Tri-Cities and the mountains are now under a “Marginal Risk”. The severe threat will be minimal for these locations. Locations north of the I-40 corridor, especially those along the TN/KY border and the Cumberland Plateau, will see the greatest risk in our region. The “Slight Risk” area also includes most of Middle and West Tennessee, all of Kentucky, part of southwest Virginia, West Virginia, southern Ohio, Pennsylvania, and Maryland. Despite the eastward shift of the “Slight Risk”, severe weather is possible across the region. 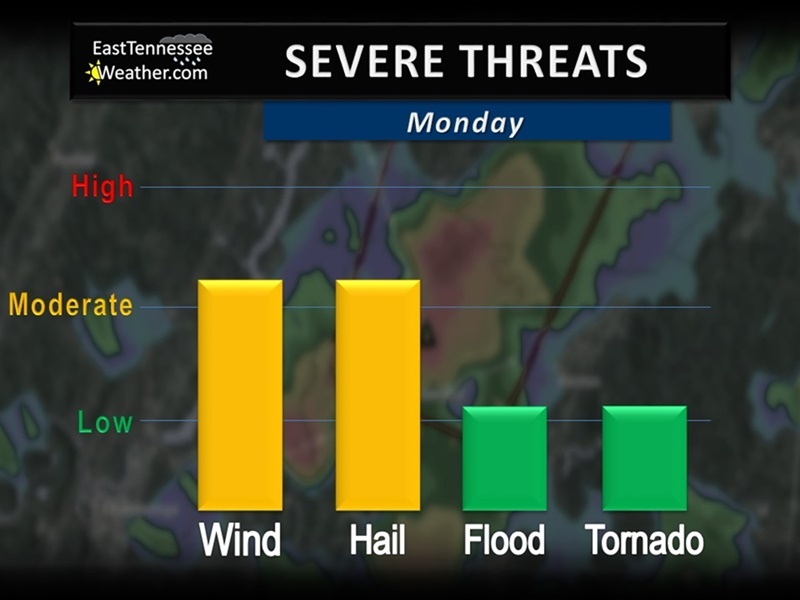 The primary threats include damaging winds in excess of 60 mph and large hail over an inch in diameter. Some storms will likely produce heavy rainfall which may result in flash flooding. Overall, the tornado threat is low. Any tornadic activity that develops will likely be isolated with limited strength. Monitor NOAA Weather Radio, EastTennesseeWeather.com, and other local media for the latest on the weather situation. If a Severe Thunderstorm or Tornado Warning is issued, seek shelter in the lowest level of your home, preferably in an interior room with no windows. If outdoors, avoid seeking shelter under trees or other tall objects. NEVER drive through a flooded roadway! It only takes a few inches of moving water to float a vehicle. As always, the EastTennesseeWeather.com team will continue to track this developing situation and will keep you updated.